Kashi Cereals: turned to granola? After all the heat they’ve endured with their chain being owned by Kellogg, packed with the same chemicals as unhealthy cereals, and the truly non-organic nature of their cereals, Kashi has still endured more heat this summer in our pantry. 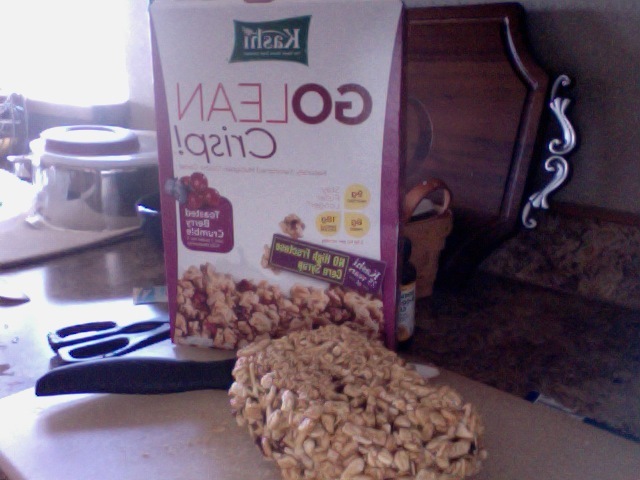 Though our air conditioner broke for less than a day, Kashi’s GOLEAN Crunch cereal managed to melt inside the box. Oh, Kashi, you and your cereal, or should I say, loosely packed granola bars? Don’t get me wrong. I love Kashi as a brand. Although not the healthiest brand out there for snacks, I’ve fallen in love with their chewy granola bars; the Trail Mix TLC Chewy Bar is my all-time favorite. But to find out that my mother’s favorite cereal can become granola was, honestly enough, even more exciting! No this article isn’t to say that Kashi is the best brand because it’s cereal is multi-purpose. It’s just saying that if something is going to melt in this hot summer weather, well, Kashi cereal is probably the best thing you’ll have wanted to melt. For example, use this new Kashi granola block to make small trail mix packs on the go. Cut some pieces and dunk into your cereal for less calories and more fiber! Give it as a gag gift to your best friend trying to lose weight or is health-conscious. I know I’d be surprised if my cereal was really one giant granola block! Take a picture and talk about how hilarious it was seeing your sister trying to cut up cereal with a Yoshiblade Knife on your blog. Sometimes, even your favorite, time-tested brands will surprise you. And I hope that when they do, they do it like this.